This week, we are challenged to use florals on a masculine card at PTI Make it Monday #261. I used Peaceful Gardens and Larger than Life and a masculine color palatte for my card. I often use trees or leaves on masculine cards, but this is the first time I have actually used flowers. I picked some flowers that did not look too floral, along with other nature images. I am in the process of mass producing a bunch of Jewish New Years cards that I need to mail by next week. 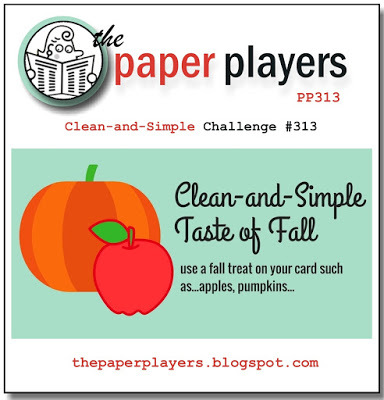 The design fits the challege this week at The Paper Players #313: CAS Taste of Fall. 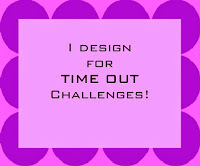 I used PTI What the Doodle Apple and a sentiment from L'Shanah Tovah. Beautiful cards, Joyce! I love the detail on the apple image--it almost looks like a woodcut. Nice use of bold color too...Thank you for joining us at The Paper Players! You nailed the masculine floral card. Striking foliage around a bold single flower. Great manly colors! Love the way you focused on the beautiful apple. Has such a festive look! Oh yes, this is a fabulous floral card. I think it works perfectly for masculine, but is just lovely for a woman too! Your apple card is cute. I like the angeld panels! Fabulous masculine floral design! And I love your striking design for the New Year's card. The apple looks awesome! Oh Joyce! Yes, yes, yes. That amazing apple, so white. And that mass of green behind it. What a great design. I totally like your masculine flower Card. The Color are great and i think the watercoloring sentiment fits perfect ! Great cards today, Joyce! The masculine card looks so awesome with the images and colors you chose. Your New Year's card is CAS and perfect! I especially love the inside sentiment. Your masculine flower card is wonderful with all that layering around one single flower! A perfect card for a man. And when I looked at it I said "there are dies for Peaceful Gardens?" lol. Love this - So pretty. I too like trees on masculine cards. What beautiful cards. I love the color & design you used for your masculine card. What a lovely card. Wow I love that graphic apple image! oh Joyce! your floral masculine card is gorgeous! I definitely must pull out my Larger than Life for this challenge. I, too, am deep in the struggle of making 45 Rosh Hashanah cards to send next week. Very clever to use the What the Doodle apple! I think that's one of the toughest PTI challenges of the year but you rocked it! I especially like the bamboo on there. Your second card is awesome too. The green layer gives the design a lot of punch.